Most produce is picked 4 to 7 days before being placed on supermarket shelves. Most produce is shipped an average of 1,500 miles before it is sold. Approximately 40 percent of all chemical fertilizers used eventually break down into ammonia and are released into the atmosphere. Animal agricultural operations produce 73 percent of all ammonia air pollution. The need for food is one that connects the world. How we get that food, however, is relatively unknown. In recent years, there has been more investigation into today’s food industry and the findings aren’t necessarily good. Horror stories of cattle and swine feedlots, overuse of chemicals, and unsustainable practices seem to be pervasive. A Gustavus Adolphus College student and professor had the opportunity to share sustainable practices through video. 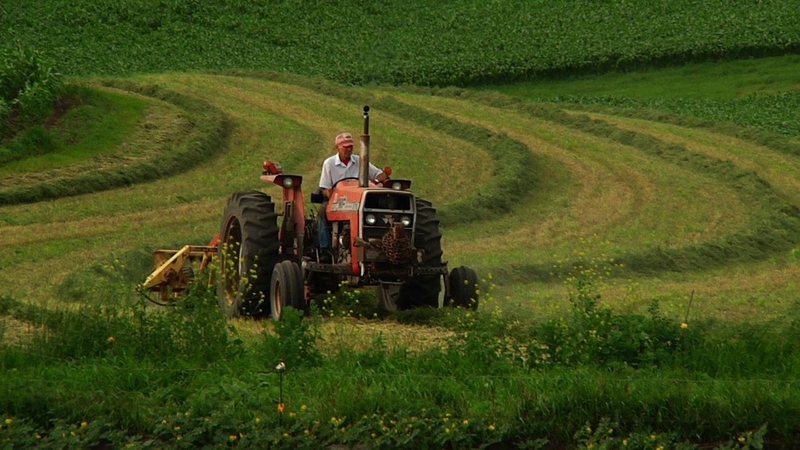 A scene from the documentary Farming Forward. Gustavus communication studies professor Martin Lang ’95 and political science and English major Ethan Marxhausen ’12 spent summer and fall 2009 producing a documentary on sustainable agriculture. “It’s about the future of farming. We want to communicate the potential and need for people to step up and get involved in sustainable agriculture,” says Marxhausen. The movie, titled Farming Forward, shown Thursday, March 11, 2010 at 7 p.m. at the Treaty Site History Center in St. Peter, was made possible through the Gustavus’s Presidential Faculty/Student Collaboration Grant. “Ethan had been involved with GACTV a lot the past year, and even as a first-year student had chops with film-making and editing. So we got together, wrote the grant, won it, and the rest is history,” says Lang. Why did this student/faculty team choose to create a documentary film about sustainable farming? “There are a number of movies that show the critical side of agriculture now: the use of chemicals and row crops. People have told us that this is an optimistic reply to that, showing solutions instead of just the problems. It’s an optimistic view of the way things can be done,” says Lang. 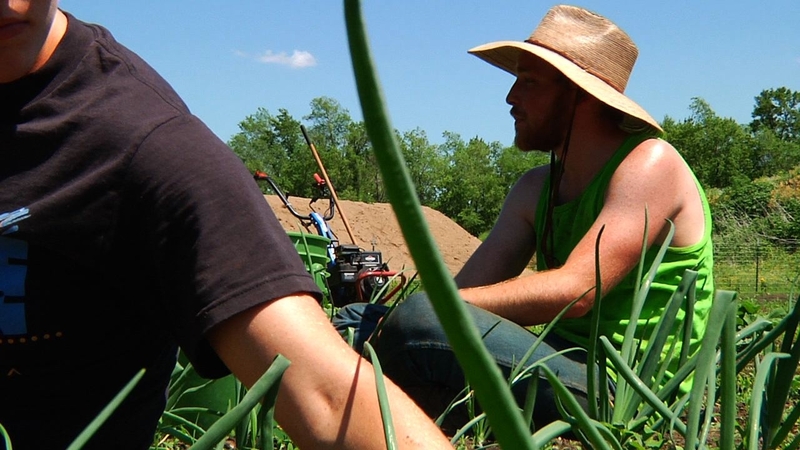 The duo spent time shooting on local farms, such as Prairie Horizons Farm in Starbuck, MN; Loon Organics in Hutchinson, MN; and Backyard Farming LLC near downtown St. Paul. When making a documentary, one of the challenges can be finding people to interview. But through perseverance, Lang and Marxhausen found outstanding subjects. “I learned that farmers are some of the most gracious, giving people in the world. Even though they have a variety of backgrounds—those that have been farming for six generations or those that have just started—they were always more than willing to share their ideas, their food, and their time,” says Lang. The Lang-Marxhausen team stayed overnight at several locations to see what farm life is really like. Historically, sustainable agriculture has had a bad rap. People who view this film may be surprised with the variety of farmers and other people in the food industry who are environmentally friendly. “Sustainable agriculture can be appealing to a variety of people, and not necessarily for a traditional reason. Being involved in the sustainable-agriculture movement can stereotype people, but in actuality, there is a lot of diversity in the cause,” says Marxhausen. But what really makes food sustainable? One local organic farmer talks about some of the practices he uses to avoid using chemicals. “A couple of the most important techniques are cover cropping and crop rotation,” says St. Peter farmer Adam Ellefson. “Cover cropping is used for both adding organic matter to the soil and for weed suppression. Organic matter in the soil is very important to organic farming because it is key for making nutrients available to the plants. Organic matter is broken down slowly by soil micro-organisms and in the process nutrients are released. Crop rotation prevents diseases and pests from becoming prevalent in a given area. You essentially move the plants ahead of the pests.” Ellefson, along with wife Lupita Marchan, have just begun their own organic vegetable farm, called Living Land Farm. A scene from Gustavus's Big Hill Farm, which is featured in the film. Despite the continuation of conventional agriculture, during the past few years there has been a noticeable increase in the interest in sustainable agriculture and buying organic. “It’s been a lot of working with young people. The past generation started the Food Coop, but it has been this generation that has really helped it to take off and succeed. Both the growers and us have grown together,” says St. Peter Food Coop Produce Manager Erik Larson. “Being outside in the fresh air and being able to eat the food right off the plant is my favorite part of running a farm,” says Ellefson. Lang and Marxhausen hope their documentary educates people who otherwise would not think about how their food gets to their plates. “If people spend more time thinking about their food, it can have a positive impact on food and everyone,” says Lang.